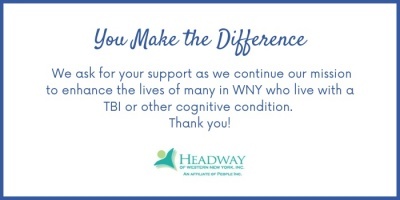 Donate :: Headway of WNY, Inc.
Headway of Western New York, Inc. relies on the support of the community to provide access to resources, support systems and advocacy in order to help individuals live as independently as possible. Please know that donations and Memberships help sustain our ongoing monthly Support Groups. Support Groups are just one way that Headway helps the WNY community. We offer support groups for individuals and families who are living with Traumatic Brain Injury (TBI), as well as Caregiver Support Groups. These groups are confidential, supportive and encouraging. Those living with TBI may experience confusion, frustration and despair. Reaching out to others and sharing stories is a powerful recovery tool. Most support groups focus on shared experiences and solutions in an empathetic group setting. Some of the benefits of participation include increased social connections and enhancement of healthy coping strategies. If you have questions about making a donation or becoming a Member of Headway, please contact us at 716-408-3100.